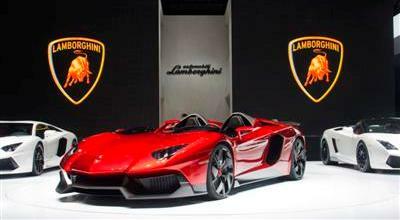 At Switzerland's 2012 Geneva Motor Show, Lamborghini presented its most uncompromising open super sports car ever. The Lamborghini Aventador J is a force of nature on wheels – supremely powerful and supremely open. The Aventador J offers its driver and passenger an experience that is said to be utterly indescribable. At the same time, the 515 kW (700 hp) two-seater is a first class technology showcase, combining innovative solutions and brand new materials and demonstrating Automobili Lamborghini’s enormous expertise in carbon fibre technology. The Lamborghini Aventador J is a radically open automobile – exterior and interior meld into each other. The designers and engineers in Sant’Agata Bolognese (Italy) have not only dispensed entirely with the roof, but also with the front windshield. 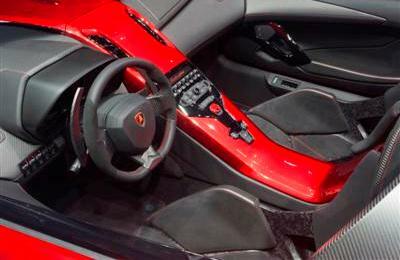 This requires that drivers of the Aventador J must have the right equipment for driving at high speeds. This kind of driving at the limit is a highly exclusive experience – the Lamborghini Aventador J is fully functional for road use. It is an absolute one-off. The letter J is derived from the sporting rules of the FIA world motor sport organisation. Its “Appendix J” defines the technical specification of race cars in the various classes. The technical basis for the Aventador J is the Aventador LP 700-4, Lamborghini’s new twelve-cylinder model. Presented in 2011, the Aventador has been acclaimed by customers. The Lamborghini Aventador LP 700-4’s technology package is unique – its structure is based on an innovative monocoque made from carbon fibre reinforced polymers that combines systematic lightweight design with optimum stiffness and safety. The new twelve-cylinder with a displacement of 6.5 litres and 515 kW (700 hp) combines the best in high-revving thrills with mighty pulling power. Its super-fast ISR transmission, permanent all-wheel drive and push-rod suspension combine this potent power with the utmost handling precision. Naturally, the Aventador J benefits enormously from this unique technology package. Yet the Aventador J has a significantly different interpretation to the Aventador coupé. In this open version, the monocoque has a largely new design, including the two safety bars behind the seats. The absence of a roof, of the large windshield, of the air conditioning system and of the navigation system obviously takes it to an even lower weight. With a dry weight of 1,575 kilogrammes, the series production Aventador LP 700-4 is already extremely light for its performance class thanks to its carbon fibre construction. The unique expertise of Automobili Lamborghini in the field of carbon fibre reinforced polymers is evident not only in the hi-tech monocoque, but also in the research into further innovative solutions. Unlike traditional seats, in the Aventador J seats are made of Forged COMPOSITE®, with inserts of flexible carbon fibre fabrics: a result of an innovative Lamborghini patent. Lamborghini have developed an even more amazing version of carbon fibre material for the Aventador J. In its first automotive application, this carbon fibre fabric called “Carbonskin” is made of woven carbon fibres soaked with a very special epoxy resin that stabilises the fibre structure and keeps the material soft. Like a hi-tech fabric, the carbon fibre mats fit perfectly to every shape. In the Aventador J, the complete cabin and parts of the seats are clad in this material and shimmer in matt carbon fibre black. It’s conceivable that in future there will be many potential applications for this freshly patented and extremely fine-looking material, even very high-end clothing. An extreme Aventador obviously needs an equally single-minded design, which goes without saying at the Centro Stile Lamborghini. Every single model from Sant’Agata Bolognese bears the unique design of the brand. Clear, precise surfaces, as well as sharp, often broken lines are among the unmistakable styling tools. They consistently emphasise the power and enormous presence of these Italian super sports cars. 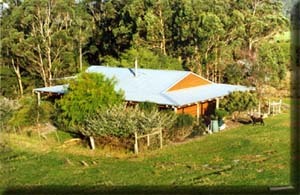 Not one line is ever accidental – the defining principle is always ‘form follows function’. This function is very clearly defined for the Aventador J – explosive dynamics, extreme driving fun, a unique experience. Every kilometre with the Aventador J is extreme fun: something plainly evident from the very first glance. Virtually every part of the outer chassis was redesigned for the Aventador J, yet it shows the spirit of Lamborghini in its most concentrated form. The car’s dimensions are extreme: the overall length is 4,890 mm, the overall width (excluding mirrors) is 2,030 mm while the height is 1,110 mm. The highest points are marked by the rear view mirror, which is perched on an arm like a periscope, and by the two safety bars behind the seats. In place of the classic front windshield there are two small wind deflectors. The occupants of the Aventador J are confronted by the element of the wind in much the same way as a super bike rider – therefore the right clothing is prerequisite for every trip. The front of the Aventador J is somewhat narrower than that of the Aventador. The front end is dominated by a highly distinctive carbon fibre air scoop, with central fixing braces and upward tilting winglets on the outer edges. 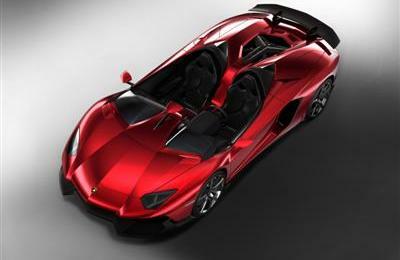 Viewed from the side, the front end of the Aventador J looks, in a way, similar to a Formula 1 racing car. The black of the carbon fibre parts is visibly evident throughout the car – the significantly wider sill elements and the mighty rear diffuser form a perfect contrast to the rich red body paintwork. The special red colour was developed specifically for this Aventador - a highly intensive red with a slight chrome effect. The wheels, of course, were also developed specifically for this car, with 20-inch rims at the front and 21-inch at the rear. The five-spoke aluminium wheels have a central lock system and an additional carbon fibre insert that functions like a small fan for optimum brake ventilation. Naturally, the doors on the Aventador J also open upward. They are considerably thinner than on the Aventador and are fitted with a tiny, fixed side window. The 'muscular' flanks around the rear wheels are hallmark Lamborghini styling effects. Because of its ample dimensions, the eye is drawn inexorably to the rear end. It consists in principle of just three elements – the carbon-fibre rear diffuser, the four huge tail pipes and the rear lights with their typical Lamborghini light signature in the form of a Y. The remaining surface area is for heat dissipation and is enclosed only by a black metal mesh. The rear end is crowned by an enormous fixed spoiler mounted on the body shell by two arms. ‘Form follows function’ to the nth degree. The spoiler is supported by two pillars connected by the diffuser: clearly inspired by racing. In comparison with the Aventador LP 700-4, the exclusive Aventador J has special bumpers at the front and rear. Both bumpers have been supplemented with carbon fibre fins that act as flow deviators. Their purpose is to achieve a significant increase in the vehicle’s downforce at both the front and the rear. The Aventador J’s exterior and interior forms flow seamlessly into each other. This super sports car turns its inside outward and is as open as it can possibly be. Conversely, the exterior ‘flows’ through the interior – a red stripe runs from the front bonnet, between the two wind deflectors, over the dashboard, down the console to the centre tunnel and back up between the seat backs, before leaving the interior and heading for the engine cover panel. This band of colour connects the front and the rear of the car, provides a visual separation between the driver and passenger space and is interrupted only by a small control panel housing the starter button and the switches for lights and transmission. The Aventador J is equipped neither with a navigation nor car audio system, nor does it have the associated screen or air conditioning controls – these would simply detract from its one and only raison d’être as an extreme driving experience. What remains, of course, are two programmable TFT displays behind the steering wheel. The engine cover also brings the inside to the outside. To be more precise, it is not so much a cover but more a framework. This part has a new geometry (X shape) and is made of carbon fibre. Two large openings lay bare both cylinder banks of the mighty V12 power unit with its 6.5 litres of displacement – a truly stunning sight for every automobile aficionado. However, following the Geneva Motor Show, this sight will be the preserve of just one – the future owner of the Lamborghini Aventador J. There is only one of them, no prototypes and no others for the Lamborghini Museum. The buyer can look forward to a truly unique, street-legal work of art. He/she will possess the most extreme expression of Lamborghini DNA in existence and a real masterpiece of high technology. But other enthusiasts of the super sports cars from Sant’ Agata Bolognese can rest assured - the Aventador success story has only just begun.